We arrived at Nourlangie Rock (Burrunggul) just as a park ranger was heading out on a guided tour. What luck? 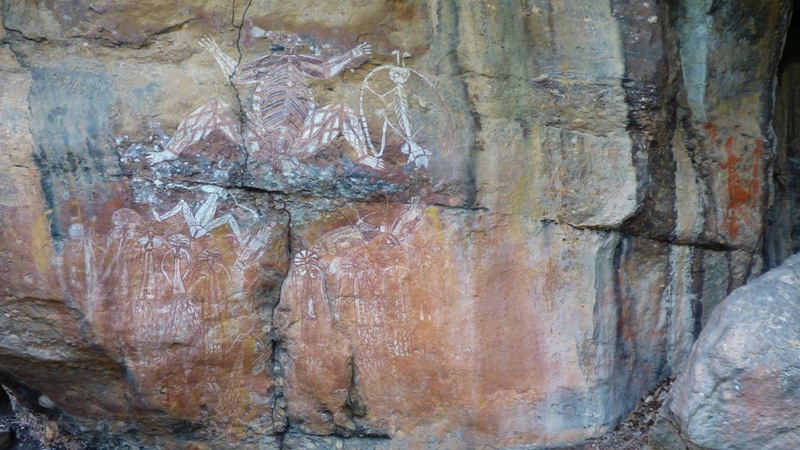 We joined the group on a circuit walk past an ancient Aboriginal shelter and other outstanding art sites, as well as Gunwarddehwardde lookout with impressive views of the Kakadu escarpment and savannah woodlands below. The rock art we saw at the Anbangbang Gallery was incredible. An explanation of ‘what’ is depicted in the painting. Here’s some other art we saw in the vicinity. Both men and women enjoying dancing. After three (educational) hours, we moved on and our next stop – Mirrai Lookout. A brisk, relatively exhausting, walk up to a lookout where we saw very little beyond the rain heading our way. We made a quick exit and can’t wait to see what tomorrow holds. Next Post Just One Love?